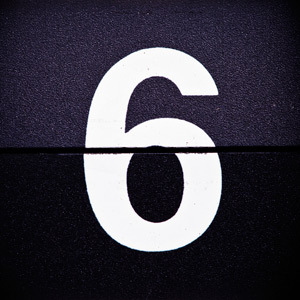 Six is the smallest perfect number. You can reach it by adding one, two, three, like Count von Count, ah, ah, ah, when I was six years old watching Sesame Street on Saturday morning, the sixth day of the week, six years before the madness came for us, and the pastor at the church stood before us, he said that God created the earth in six days, he said that God let his own son hang on the cross for six hours, yet he couldn’t say the right words, not even one or two, to save my brother, my family. In grade school I learned that Adolf Hitler led six-million Jews to the gas chamber, to the trenches, to the dark woods where the monsters waited, and I wondered why God sat by and watched. One light-year is six-trillion miles, and the nearest star after our Sun is over six light-years away, and I wonder sometimes if maybe God is out there, that he’s too far away. Six-hundred thousand died in the War Between the States, sixty-thousand never came home from Vietnam, six died last week in a winter storm, six thousand die on this planet every hour, the numbers drive me crazy and yet…six years ago there were over six-billion souls in the world, now there are more, we make six new babies every hour, we just keep on going, so maybe God has it all figured out. "You can't deny laughter; when it comes, it plops down in your favorite chair and stays as long as it wants."